This post is linked to Simply…Gluten Free (Gluten Free Photo Contest). This post is linked to Two for Tuesdays at Girlichef. No story to go with this recipe. No witty thoughts. Just a poem. Food for thought. Then thought for food. Grab tissue and a quiet room. Read this and then hug your children. Make these muffins and then eat them together. To what your children are trying to say. Or they won’t come back to listen to you. They’ll grow up exactly how we hoped they’d never be. They’ll grow up believing they are winners in the game. And though you scold them, make sure you hold them and tell them they’re all right. —Denis Waitley, best selling author, speaker, poet, and lyricist. Sometimes, a reminder like this helps us focus on what is really important in our lives. Missing the smallest moments may lead to our biggest regrets. So grab your kids and make some muffins. And take a moment to listen to them. These muffins are filled with omega goodness and protein. They are a perfect way to tell your children that you love them. They are also a great treat to start the morning off right and a perfect snack to throw into your child’s lunchbox. As written, they are Gluten-Free, Dairy-Free, and Soy-Free, with directions on how to also make them Nut-free and Egg-free. 1. Preheat oven to 350 degrees. Line or grease a muffin tin. In a medium bowl, thoroughly sift together gluten free flour blend, almond flour (or additional flour blend), flax meal or ground chia seeds, baking bowder, baking soda, cinnamon, pumpkin pie spice (or additional cinnamon), and salt. 2. In a high-powered blender, add eggs (or already mixed egg-replacer), honey, coconut or other mild tasting oil, vanilla, and Hemp milk (or dairy-free milk of choice). Blend on high speed for 30 secondes to one minute. 3. Mix the wet ingredients into the sifted dry ingredients. Then gently fold in the raisins. 4. Fill muffin liners or greased tins 2/3 of the way full. Bake for 13-15 minutes, or until toothpick comes out clean. This post is linked to Kelly The Kitchen Kop’s Real Food Wednesday. This post is linked to Simply Sugar and Gluten Free’s Slightly Indulgent Tuesday and Gluten Free Homemaker’s Gluten Free Wednesdays. You’ve really put out some amazing posts in the last week, Kim. Thanks so much! What a lovely, thought-provoking poem – and I agree with what Shirley said! We need reminders like that. The muffins look lovely, too – I used up what was left the almond flour to make the cookies I posted; if I hadn’t, I could have also made these! The only thing I don’t have, aside from almond flour, is flaxseed or chia seeds – I’ve used flaxseed before, but don’t know what chia seed is like. Zoe, you are so sweet! Thanks for the kind words. I just ran out of Almond flour too, which is a bummer since I order mine and it takes about a week to get it! Chia seeds have similar properties as flax seeds, but they have additional benefits of containing antioxidants and research has also shown that they can help to regulate blood sugar levels. Chia and Flax can be used fairly inter-changably. I also think ground Chia seeds taste better than flax! Kim – My son isn’t little anymore but the sentiment of the poem still holds true for an adult child. (And as Shirley reminds us…for husbands, too.) Love the muffins. And, the tip about soaking the raisins. Thanks! Thanks Nancy! Kids young and old need to know their parents are still listening. I am getting closer to 40 and I still love knowing that my Mom is there to listen and do anything in the world for me! p.s. Just got some delicious looking organic figs to make your recipe. They are going to be my dinner tonight since Kurt is taking the boys camping and I am on my own!! Can’t wait (for the figs and for being on my own tonight, hehe)! I suppose I should save the doughnut muffins for when the kids are back though, so that I have help eating them! The figs I used were organic and so delicious. Enjoy–the figs and the alone time! Beautiful post and Beautiful muffins! Love that photo – healthy never looked so good. Wendy, I like being called a young whippersnapper. hehe. But next weekend’s bday brings me only a few years away from 40 and I swear that I have already had a few visits from those hot flashes (although hoping it is the fact that I live in 100 + temps all summer)! mmmm oh yea, these look delish~ i’m gonna have to give this recipe a try! 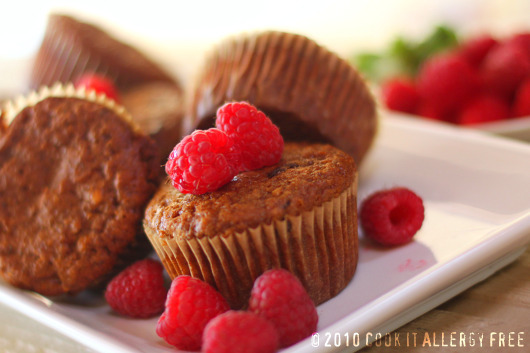 Those muffins look so good with the colorful little raspberries! Beautiful poem and so thought-provoking and truthful. Your pics are gorgeous! And so is the poem. Thanks for sharing! Have a wonderful time this weekend…I’ll be thinking of you. Hugs. Amy, we will so miss you this weekend! ;( But, I know (and am very excited) that we will have many other opportunities to meet in person! Yay! Thanks for the kind words about my pics too – so appreciated! I hope you and Joe have a great weekend! Waw!! What didivine & tasty looking good – for – you muffins! MMMMMMMMMM,…I so much love all of the flavours you have used in here! Thanks for the poem. It’s a great reminder, and I can say it’s true for little kids as well as teens. Your muffins look wonderful. Thanks for sharing them at Gluten-Free Wednesday. 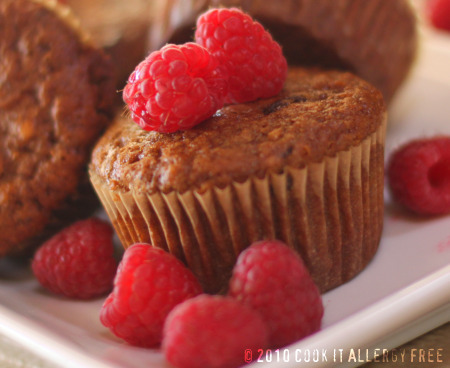 You have a beautiful blog & these tasty breakfast muffins look the best!! Waw! MMMMMMMMMMM,…Many greetings from a fellow new GF foodie from Brussels, Belgium! I started being & eating gf since june 20108 I am loving it too! Hi Sophie! THanks for the kind words about my blog and the muffins! And welcome! I love finding people reading my blog from all over, and now from Brussels, Belgium! How wonderful!! Thanks girlichef!! For me, when I remind myself to slow down, I find myself having so much more fun with my kiddos! Just needed a reminder after a pretty hectic week. So the poem seemed appropriate! Thanks for letting me join in the blog hop! I think you guys have a great thing going and really looking forward to the upcoming “surprise”! What a thought-provoking poem! One that I should read more than once! The muffin recipe looks delicious, I love that you gave us all sorts of options so it can fit different dietary needs! Perfect for Two for Tuesdays – thanks! Glad I could be a part of Two for Tuesdays this week! What a great message. This is just the type of sentiment that we love to see at the Two for Tuesday blog hop, sharing food and love. Thanks! Btw, you guys rock in your comments to the people who have joined into the blog hop! Love it! I really would like to try these bran muffins soon, the recipe sounds fabulous! I’ve added it to my favorite recipes from last week post. Thanks! Yay, Aubree! Thanks so much for linking up my recipe to your “favorite recipes from last week” post! So excited I made the list!! 😉 Woohoo! Delicious looking muffins, and love the sentiment expressed in the poem. We often get so “busy”, that we forget to be truly “present” with those we love – be they tiny people or grown-ups. Thanks for sharing this. Hi Sue! Thanks for your sweet comment! A reminder like this, every now and again, can be quite helpful for us as busy moms! could I use all almond flour with the added xanthan gum? They taste just like bran muffins! they are delicious. I used nutmeg instead of pumpkin spice…the only thing was that they are crumbly becuase their is no xanthan gum, but if I use cupcake liners in the pan it is just fine!